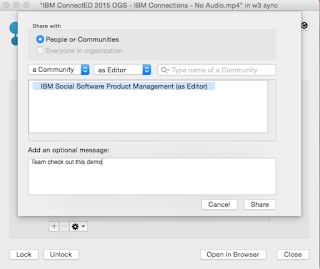 Socialize Me: The IBM Connections Cloud June 2015 Release Is Now Live -- Check it out! The IBM Connections Cloud June 2015 Release Is Now Live -- Check it out! Over the weekend we pushed out updates to our IBM Connections Cloud users (for those fathers out there, consider it a Happy Father's Day gift). Another update this month was for developers. Developers can now take advantage of the embedded experience extension point within the Activity Stream. Each person and community has an activity stream (which follows the ActivityStrea.ms / OpenSocial 2.0 standard) which allows 3rd party apps to inject events into it (e.g. you could get alerts from an app telling you that an approval is required). One of the first developers to take advantage of this in the cloud is AppFusions. They've now built connectors that are sure to please various roles within an organization. For example, if you want to get updates to files updates in Box, you can. If you want to get updates when new code has been submitted to GitHub, you can. Or maybe you are a marketer and want to stay up to date with updates from Twitter.